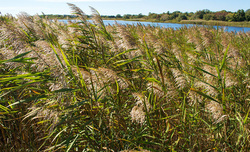 Non-native Phragmites, also known as common reed, is a perennial and aggressive wetland grass. Growing in dense stands of reeds over 10 feet tall, it is easily recognized by its height and distinctive fronds of fluffy seed heads, which turn from purplish in July, to brown, then gray by October. Found in marshes and swamps, along streams, lakes, ponds, and ditches, Phragmites is most commonly associated with coastal brackish water, as well as disturbed, moist sites. Often found alongside roads, stands of the reed are easy to spot-even by motorists traveling quickly. More and more prevalent in Scarborough, Phragmites has become so common, many mistakenly believe it is "the marsh." Often very difficult to eradicate, Phragmites can be an aggressive species that rapidly colonizes new areas. In addition to distribution of the seeds in the seedhead that can be seen at the top of the plant, shoots and rhizomes grow from the nodes, spreading the plant far beyond its original bounds. Rhizomes may reach 10 meters or more in length, and in sparse stands, shoots that fall over become horizontal runners. Why is Phragmites a problem? Phragmites can be an indicator that a wetland ecosystem is out of balance. Disturbances or stresses such as pollution, alteration of the natural hydrologic regime, and increased sedimentation favor invasion and continued spread of Phragmites. According to the best available scientific information, there may be a strain of Phragmites, native to the US, which is non-invasive and relatively rare. The non-native Phragmites, which tends to grow in monospecific (one species) stands, out-competes other plant species. In contrast to beneficial wetland species, Phragmites provides little food or shelter value to saltmarsh dependant wildlife, and contributes to the loss of biodiversity of the associated native fish and wildlife species typically found in a healthy saltmarsh. Phragmites itself becomes a greater and greater problem as the quality of our wetlands deteriorates.